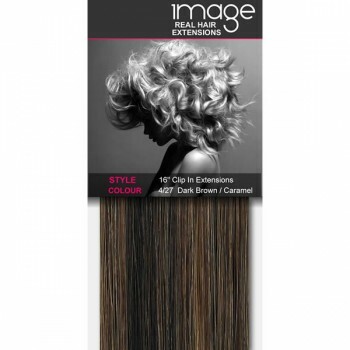 As official stockists, we're delighted to be able to offer IMAGE hair extensions to our customers at great prices. IMAGE clip in extensions are fabulous 100% Remy Human Hair Extensions and these sets of 16" clip in extensions are enough to do a full head. Just one pack will give you added length and volume quickly and easily! Image hair extensions are silky soft and smooth with every 16" set including over 90 grams of the finest quality real hair. Featuring silicone clips on every section, you can rest assured that once they are fitted in they will be completely invisible and thanks to the colour choices, will blend seamlessly with your hair. Your friends and family won't believe it when they see how long and luscious your hair suddenly is!